Weird old season thus far. Play a week, skip a week and never really get going. Would be good to have a solid run of Bryant and Mays. Match me, Sidney! Home on the Adastral range ce soir and is it me or is it a tad warm in here? Being a Tuesday, Yang's not in the gang so up steps trusty sub Alison who managed to net a couple of valuable points for us last year. 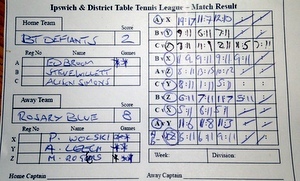 And, in doing so, may have kept us up in div 2. Makes a player think, to be sure. Alison opted out of the doubles but Ed and Steve were no match for the Essex pairing of Phil and Matt. Four games, four defeats.